An impossible project brings a feature, win, AND giveaway! Most of you have seen my bedroom a bazillion times by now. When I first decorated this room, I couldn’t believe my nerve.Would I get away with this?!? I remember the doubtful yet curious comments when just showing the ‘befores’ of the components. But I went ahead and created what was in my head and posted it anyway. Nerves of steel I tell ya. The room was a hit. So I continued to add additional unique components to it hoping they would be equally well received. Which they were. Right down to this torn sheet lampshade I created in 5 minutes which derived from a need to cover up an otherwise dirty one for a Christmas showing of my home. And where is this ‘way out there’ bedroom now? Romantic Homes, a blog spotlight in the Jan 2010 edition. If something scares you, try it anyway. Step slightly out of your comfort zone each day. Put together something you NEVER think will work. Then make it work. Beg, borrow and steal from freebie piles with an open mind. Choose ‘uniquely you’ over copycat decorating. Create to your heart’s content, no matter what others may think. Try what’s in your mind. It’s there for a reason. There aren’t many that desire to take these kinds of risks. Oh. And my impossible bedroom has been elsewhere. It won a contest in October. some lucky American gets to go shopping. 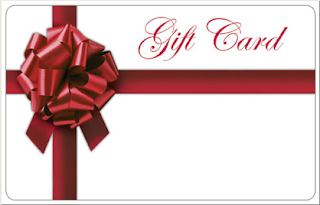 Click the sponsor store button or HERE to enter! Are you a risk taker with your decorating? What’s the bravest thing you’ve tried to date? 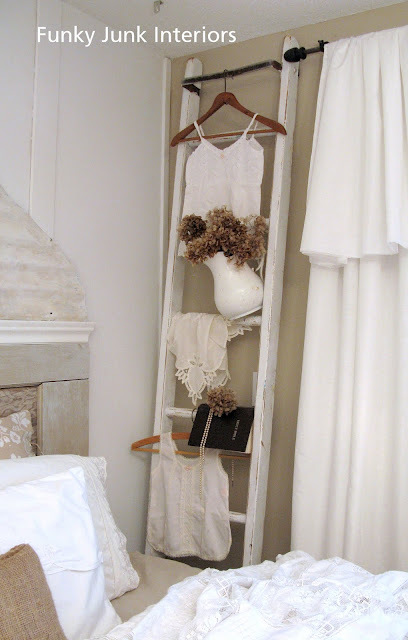 I am soooo finding an old ladder for my room!!! Congratulations on being featured in the magazine. Wow, that’s so cool and well deserved! I adore your room Donna. And I’m so happy that you are being featured. Lucky them for getting you in their magazine. Isn’t it fun knowing that you, Ms Mustard Seed and Anne are all featured together! Congrats!!! Your rooms are always fabulous! I love your risk taking adventures! I would say that I am a risk taker as well. I love putting unusual color combinations together..esp. patterns!! The bravest thing I have done so far is putting copper sheets on a whole wall! Aiiieee!! Took forever! Well deserved Donna! You know I love your style. And it’s those nerves of steel that really inspire me! ….. Merry Christmas! Congrats on the magazine feature, you definitely deserve it! I love the moral or your story, very well said! Merry Christmas! Adding my Congrats to you! Your room has such a peaceful and calm feel to it. It will provide inspiration to many but will never be duplicated. Congratulations Donna. Your bravery makes you a trend setter. 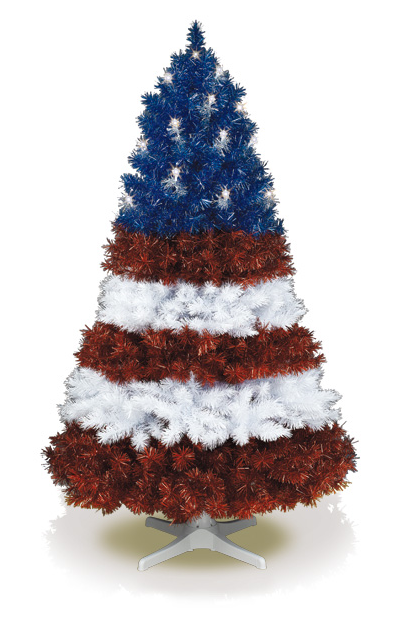 Everyone wants to have the nerve to decorate like you do. I know I play it safe and have VERY traditional decorating …. 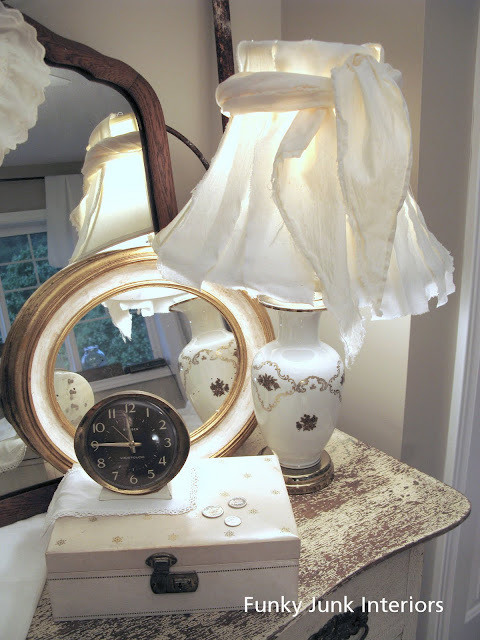 but like to add a couple quirky items to just lighten it up. I hang cast iron vent covers on the wall. I love their designs. Sit scales on Queen Anne furniture, shoe forms on the bookcase, etc. Everyone needs a touch of whimsy. Congrats on your HGTV feature and magazine spread, you deserve all the success Donna, your ideas and execution are so inspiring. Donna all your hard work is reaping wonderful things! You are ROLLIN’ Sister!!! YAY!!!!! A door open here, another one there…they’ll just keep swinging open! All you gotta do is walk in – dragging your junk with you, of course! Congrats on the “daring-do” which has paid off in such a big way. You are talented and I think you should continue to trust your instincts. They ar Spot on! You so deserve as many features as possible! You are one reckless, fearless, marvelous and unique lady! What would we do without you?! Thanks for always being a little bit wacky (meant in the kindest of ways!) and have the most wonderful Christmas ever! at it because it is gorgeous!!! Very exciting! What fun you have had….smiles…. let’s see, I moved my dining room into the living room, so that I could accomodate the 3 leaves, inserted for Thanksgiving, and moved all of the living room furniture into the dining room, and it worked….smiles. Wow, your bedroom is dreamy. You are such a talent. Gorgeous!!!!! Congrats, Donna! Your style is so unique and gorgeous! I don’t look at “so called” junk in the same way since following your blog. So fun to see you recognized by HGTV and Romantic Homes. Well deserved! Not only do you have the idea, but you know how to follow thru to make it all work together. Congrats on your accomplishments and great press! The gate headboard of mine is really a fave. You deserve all the recognition – your ideas are inspiring and motivating. Donna, that is just fantastic! Good for you, getting featured on both HGTV & Romantic Homes. Quite the accomplishment & well deserved. Good job, you should be proud. Congratulations. Way 2 go. This is a beautiful Christmas. I’m so looking forward 2 all U discover in the new year. You have spent the last couple of years working so hard to bring everyone unique and fun ideas that are easy to replicate in their own homes, and it’s time that the big guys took notice of you. Well done! I just know this is only the beginning for you. Bigger things are surely on the horizon. I hope you have a wonderful holiday season. Congratulations! Congrats Donna–you so deserve it! I love, love, love your bedroom and it should be shown all over! Congrats to you! You are such an amazing inspiration and so talented and unique! I can’t wait for more of your treasure in the new year! Merry Christmas to you and yours!! Look at you! and you didn’t even mention the SIGN HEADBOARD that used to be yours and moved to the game room for a backdrop to the day bed! You’ve got lots of mentions here. You’ve got the talent girl! It ought to be shown off! Donna, you are such an inspiration on so many levels! Encouraging, creative, and uplifting! What’s my most creative venture? Painting our kitchen island turquoise last year…so many friends told me it was ‘awful, how could you do that? 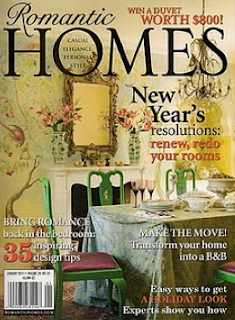 !’ And now…look in any design magazine and you will find a turquoise island. See friends…I am not crazy, just creative! HA! Love you Donna…and congratulations on your feature!!! Reading this put a big smile on my face. You work so hard. 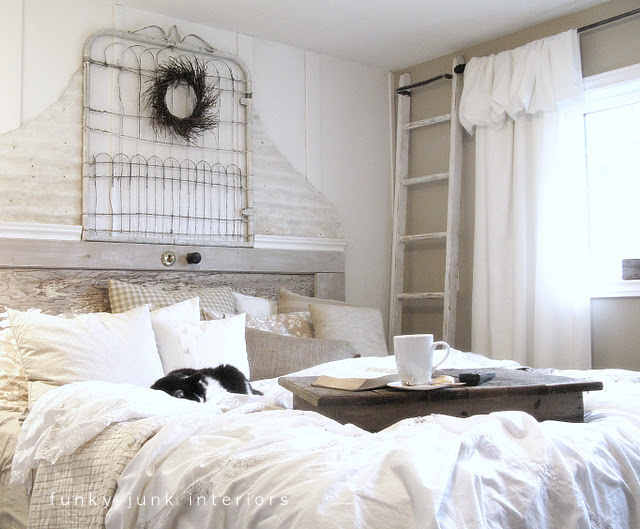 I am new to this site and your bedroom is AMAZING and totally deserving of all of the attention. GORGEOUS! Congratulations on the well deserved features Donna! I could see your bedroom a gazillion more times and never get tired of it. I love its uniqueness and the tranquility it exudes. I love the moral to your story. I hope you and your family have a truly blessed Christmas! 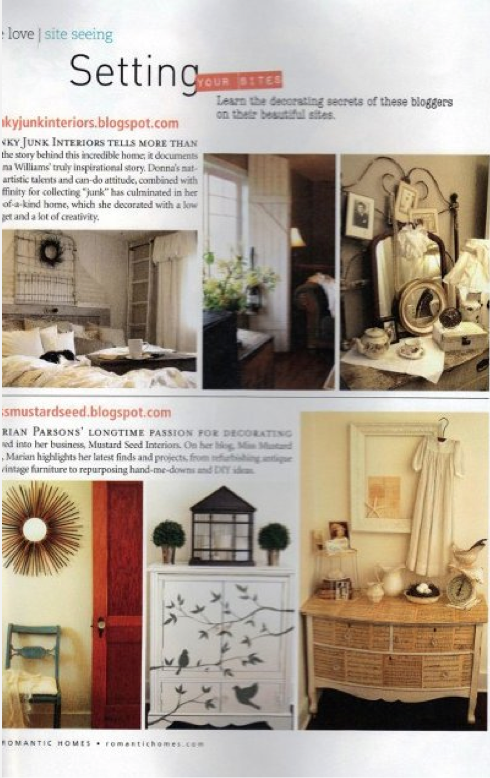 Congratulations on your well deserved recognition–your bedroom is GORGEOUS!!!!!!! I will never be tired of looking at those beautiful, inspirational pictures. Thank you so much for sharing your wonderful visions with us. CONGRATS & well deserved! !I keep trying to get to our master bedroom but so far, it don’t/can’t look like this :)….do you have kids that think your room is their room LOL???!! Congratulations on your big time features!Your decorating is amazing and gorgeous,the recognition is well deserved! Pure genius! You should have a magazine of your own! Congratulations and Merry Christmas! YEAH! That is wonderful. It couldn’t have happened to a better person 🙂 That is so exciting!!! I luv the room! Awesome:) RIGHT UP MY ALLEY! Beautiful:) Congrats! Donna, Lots of great things happening for you right now. Congrats and I couldn’t be happier for you. Well deserved. I posted my comment about this post in the wrong place. I am happy to have found you! I love your inspiration and encouraged risk taking! Congrats! It couldn’t have happened to a better person!! What a great Christmas present!! Merry Christmas! Donna I am so proud of and for you!!! Woot Woot, that is fantastic! And you are in such amazing company!!! How did they find you or do you guys send in pics? I can’t wait to pick the magazine up! I hope you have a very Merry Christmas with those you love! I just love ALL your unique and creative decor. Congratulations!!! You deserve all the accolades and more. Hope you get a book deal next! Hmm, I’ve done a lot of out there projects. My yellow barns w/lipstick red doors, fire bucket as planter, vintage velveeta boxes as storage in my kitchen and, of course, the animal cracker and raisin boxes on my tree… These are all so fun (and freeing) for me as I used to be a really conservative and formal girl. Now my family just shake their heads. But, if Momma’s happy, everybody’s happy (right?)! Thanks so much for encouraging us all to be ourselves! Hope your Christmas is fun! Congrats!!! Your room is beautiful and unique, I love that. I just picked up that issue on the news stand this evening and have not had time to even crack the cover, can’t wait to see your feature. Have a wonderful Christmas. Oh Donna, this is soooo exciting and you so deserve every bit of recognition! I am very happy for you! I wish you and you son a very happy Christmas time! Love your room! Congrats on the HGTV feature. 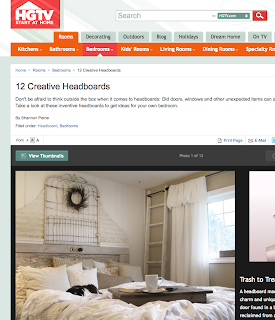 I am there with you except my headboard is on the Over the Top 20 headboard gallery! Congratulations!!!! Your room looks like it belongs in a magazine. It is a wonderful Christmas gift to be so well received and to know that your hardwork is more than worth it. KUDOS, you deserve it. You have an amazing eye and style. If you ever want to come visit Maine, I have a whole house for ya! A few months ago I painted my laundry room a smoky lavender color. I had a few paint samples on the wall, and everyone kept telling me my favorite one was TOO DARK. So, I painted it anyway… now everyone who walks through it says “I love this color.” It’s smokey and shadowy and perfect! Think of all the old ladders that will be reborn after millions try to reproduce this room Donna!! Rejoice! Love it, congratulations to you. Thanks again for the “flowers in the snow” post. I’ve loved your bedroom from the moment you first started posting about it. It’s incredible. You definitely deserve all these accolades! Merry Christmas! Donna … wishing you and yours a happy Christmas and a healthy New Year. Thanks for all your inspiration this year … looking forward to next year’s ideas. You must happy to see your design work appreciated by others. Well done. What a beautiful room. Congrats, Donna! The feature is well-earned! I came across your blog-and feel like i am looking into a mirror-a more polished finished mirror-but a mirror none the less.the things you love-old gears, stencils, wooden boxes, old chests, sewing machine drawers, blue canning jars-(did my sons rehearsal dinner floral arrangements in them) wooden gates..all my loves and the items i search for a auctions–you have a pic on your blog of a berry tree in the snow–just posted one today after taking my morning walk and then came across a pic of yours….i am your newest follower and will be your biggest fan–cannot wait to go thru all of your projects! Love your blog! Such a shame you can’t spend your own prize money, but thanks for sharing! !